Biking is one of the most fancied ways to pass time during leisure. While there are people who bike for exercise and fun, others do it for transportation. Regardless of the intended purpose, there are different units for biking such as an electric tricycle. Compared to the conventional bicycles, a tricycle has more room for other things like a shopping basket and extra seat. Besides, a tricycle offers unrivaled smooth riding experience due to the presence of three wheels. There are so many tricycle models in the industry that choosing one isn’t a direct purchase. 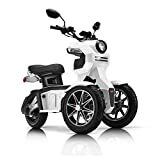 Therefore, to buy the best electric tricycle, you should consider among other things your intended purpose. Take a look at the following reviews in order to discover which one best suits your needs. Designed for people aged 12 years old and above, the Mantis Tri-Rad Folding Adult Tricycle features a large saddle to improve comfort. 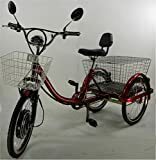 This tricycle includes a chain guard, bell, front fender and rear basket for peerless convenience. 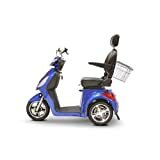 It is equipped with a low cut frame and parking brake to provide easy mounting and dismounting. The frame is foldable, thereby, making this trike very easy to store when not in use. Its wheels and tires are well-constructed with aluminum rims for extra durability and longevity. 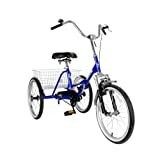 Furthermore, this tricycle is available in blue and silver colors to choose from. With a 12V rechargeable battery system, the Razor Power Rider 360 Electric Tricycle can reach speeds of up to 9mph for 30 minutes of continuous use. It is sturdy and heavy-duty to support riders of up to 120 pounds and people aged 8 years upwards. Riding on this tricycle is simple, as it works with the push of a button and no pedaling is required. The tricycle allows you to cut full 360-degree spins; thanks to the rear dual inclined caster wheels. What’s more, it has a front hand-operated braking system to give you the best performance on the road. Crafted using a heavy-duty tig welded steel frame and fork with anti-corrosive powder coating paint, the PIFIFF Adult Scooter Tricycle can stand the test of time. It boasts a weight limit of 270 pounds so that most adults can ride comfortably. The seat is well-made with a backrest to provide a comfortable platform for short and long rides. Its wheels and tires are also well-crafted with double wall aluminum rims to take on any terrain. Moreover, the tricycle is available in large and small to suit people of different heights. If you are looking for a tricycle designed for smooth rides, then consider the RMB EV Libert-e Adult Electric Tricycle. It has heavy-duty front shocks and a powerful lithium battery to offer smooth rides. Thus, the tricycle is suitable for exercise and easy mobility around the neighborhood. Also, it boasts dual rear wheel power with differential to offer excellent tight turn radius and traction. Other features include twist throttle front, rear disc brakes, LED headlight, aluminum alloy wheels, and a large basket for shopping or going to picnics. Weighing in at just 11kgs, the TopMate Electric Mini Tricycle is lightweight and portable, so you can even place it in the truck for travel and leisure activities. It has a maximum weight capacity of 120kg; hence, it can accommodate most adults without wobbling. Ninety-eight-percent of the entire tricycle is made of aluminum alloy to ensure it is corrosion-resistant for durable performance. The tricycle has a patented, easy and quick way to open and close as well as to fold and unfold for storage when not in use. Additionally, this tricycle comes with 18650 power lithium battery to go up to 35km on a single charge. For a tricycle that can give you a subtle control on different road surfaces and unprecedented driving fun, the Doohan iTank Electrical Tricycle is your go-to product. It is mainly constructed of aluminum and steel to give you a durable unit that can withstand frequent usage. This tricycle has side-deflecting dual front wheels to give you the balance required for swift spins. It is available in black, red, and white for you to choose your most suitable color. In addition, this model is beautiful and stylish with a high-quality paint that does not fade easily. Consider the Adult Electric Tricycle Scooter for either commuting or exercising. It uses a brushless motor to move at speeds of up to 20mph. And it is equipped with an efficient battery that recharges in 4 hours with the included charger. With a maximum weight capacity of 400lbs, this model can accommodate an average adult comfortably without wobbling. The tricycle is easy to operate with variable speed control that can be adjusted through a twist throttle or by pedaling. Even better, it comes with a headlight and an electronic alarm system to improve performance. Constructed with a 5000W motor, the Goplus Electric Tricycle for Adults has a splendid power to reach speeds of up to 18.5mph. It has an LCD display to show you 5 different speed adjustments even in poorly lit conditions. This tricycle is equipped with LED headlight and backlight to provide increased security if you are riding in the evening. There are anti-slip thick tires which are great for snowy or rainy mountain way and roadway. Besides, this tricycle runs on a large capacity lithium battery with a smart fast charger for quick charging. The eWheels EW-29 Electric Combination Tricycle is an improved version of the previous eWheels models. As a result, it can be operated as a regular trike by pedaling or as an electric trike with 100% electric power. Unlike the previous models, the EW-29 has its battery placed underneath the rear basket instead of underneath the seat. There is now an emergency brake tab on the brake handle for keeping the unit immobile when not in use. The back wheels are now covered by a frame on the outside instead of being exposed. Moreover, the tricycle has an improved LED electric headlight and horn for increased security when riding after dark. This scooter makes a great mobility tricycle for fun and transportation due to many reasons. For starters, it is equipped with a 48-volt battery with a smart charger that can cover up to 45 miles range on a single charge. The motor is also very powerful, thus it can reach speeds of up to 18mph, making it one of the fastest mobility scooters on the market. This unit boasts a digital anti-theft alarm to prevent thieves from making away with it. Other features that are fascinating about this scooter are the storage basket, two rear shock absorbers, a reverse switch, and armrest. Although tastes and preferences may vary from one rider to another, your choice of the best tricycle should not be completely based on aesthetics. Instead, it should be comfortable, stable, sturdy, maneuverable, and, above all, include all the features you require. That being said, we believe you are now well-informed and ready to make your purchase of the best tricycle.